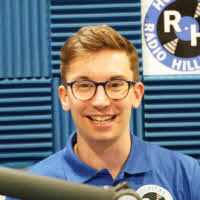 I'm George Reed and I joined Radio Hillingdon at the start of 2016. I used to have my own radio show at my University’s Station, and ever since leaving several years back I’ve wanted to get back into it. Being able to be a presenter at the Hospital that has meant so much to me over the years is a real win-win! Being able to bring some entertainment and happiness to people who really need it, whether it’s through nostalgic tunes, new hits or my on air ramblings..! You can hear me every Sunday afternoon 3 till 6pm for a great mix of entertainment, humorous chit-chat and fantastic music. I also present the Radio Hillingdon Request Show every Tuesday evening along with Graham Harrison, where you say and we play! My favourite food, is a hard question because I will eat nearly everything put in front of me…! But will never turn down a good Burrito! My favourite colour is either dark blue or purple. I am a MediaPlanner for the TV Broadcaster AMC. I think of new ways to attract viewers to our channels, as well as keeping our fans. I never thought I would be involved with the “behind-the-scenes” of TV Planning, but it’s exciting and rewarding! My favourite holiday destination? Well I think a holiday I will never forget is Orlando, Florida. Being both a theme park nerd and a Disney fan, combining the two with so much more made for a magical holiday. But to be fair, I’m excited to go anywhere new!